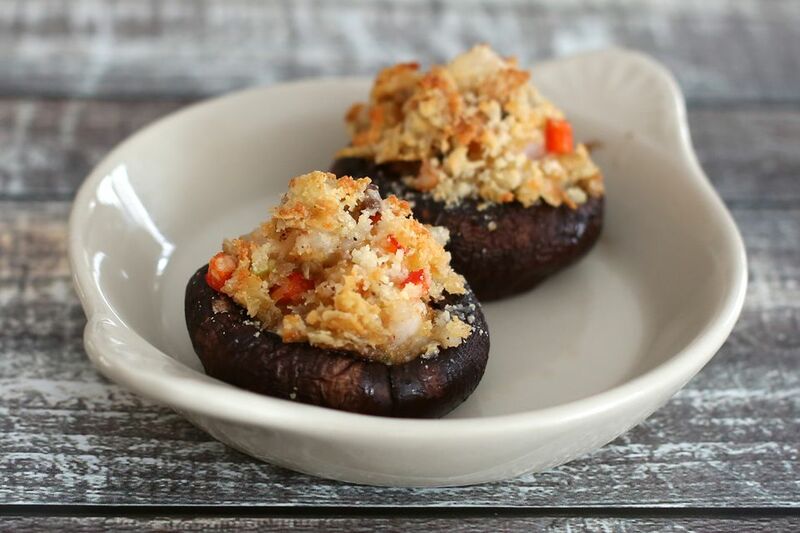 Crab meat and bread crumbs make up a simple and very tasty stuffing for mushrooms. The crab stuffed is loaded with texture and buttery flavor. Some finely minced red bell pepper and green onions add festive color to the stuffing. These mushrooms are versatile as well. Use chopped cooked shrimp in the stuffing instead of crabmeat or change them up even more and make them with minced ham, browned bulk sausage, or chopped bacon. I used portobello mushrooms for this recipe (pictured), but regular button mushrooms are fine, too. This would make an excellent appetizer for a game day gathering, special dinner, holiday party, or a movie night snack for the family. Wash and trim the end of stems from mushrooms. Pop remaining stem out. Chop stems finely and set them aside. In a medium saucepan melt 2 tablespoons of the butter, Brush the melted butter over mushroom caps. Spray a shallow baking dish (about 8-inch square, or one which will fit mushrooms in one layer) with nonstick cooking spray, line with parchment paper, or grease the pan with butter. Melt the remaining butter in the saucepan over medium heat. When the butter is hot add the reserved chopped stems, minced green onions, and red bell pepper. Cook for 3 to 5 minutes, or until the vegetables are tender. Combine the onion and butter mixture with the bread crumbs, crabmeat, Cajun seasoning, and pepper. Taste and add salt, as needed. Fill the mushrooms, mounding the stuffing in each cap. Sprinkle each filled mushroom cap with a little Parmesan cheese, if desired. Bake for 15 to 20 minutes, until the crab stuffing is hot and mushroom caps are tender. Serve them hot. If you need to keep them warm for a lengthy serving, use a warming tray, chafing dish, or slow cooker. Omit the green onions and use a few tablespoons of finely chopped sweet onions. Substitute 3 to 4 ounces of cleaned, deveined, and cooked shrimp for the crabmeat. Chop the shrimp finely and add to the breadcrumb mixture. Other possibilities for meat: cooked bacon, browned sausage, minced ham, or pancetta. Leave the crabmeat out completely and add about 1/2 cup of shredded cheese and a few more tablespoons of minced vegetables.